Alumroot (Heuchera spp. ): growing, planting, caring. A well-known perennial, favoured for its colourful foliage. Scientific name : Heuchera spp. Heuchera - the alumroot or coral bells - is a genus of evergreen herbaceous in the family Saxifragaceae, all native to North America. It is a perennial growing 20-30 cm high (8-12 in) with rosettes of palmately lobed leaves in shades of green, pink and bronze, often variegated or textured and white, green, pink or red flowers in spring. There are approximately 37 species, but horticulturists have developed many hybrids with an extensive array of sizes, shapes, and flower colors, and foliage types. 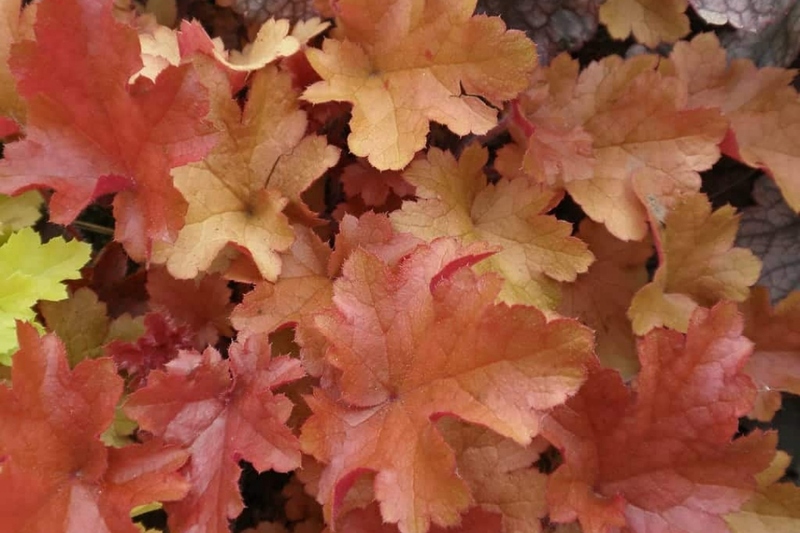 The majority of Heuchera sold for gardens are hybrids of H. americana, such as 'Green Spice’, or crosses of Heuchera with Tiarella treated under the name × Heucherella. You will plant the tree in the spring or fall. In open soil: Choose a place that is preferably partially shaded during the hottest hours, knowing that the coral bells flowers more when it receives the sun during a part of the day. The soil should be fairly cool and well drained: the coral bells likes soils that are rather rich and therefore ideally fertilized before planting. Potted: The coral bells is an ideal plant to garnish your pots, pans and planters. Present in all shades of pink and red, it is very decorative in association with other flowers, and it and keeps a beautiful foliage until the first frosts. Make sure your pots are well drilled at the bottom. Put a bed of gravel or clay balls at the bottom to improve drainage. In any case, space each 30 cm coral bells in order to give it room to grow. Thoroughly tamp the soil so as not to let air in contact with the roots, then water abundantly. The watering of the alum root is recommended the year of the plantation, afertward it should hold pretty well against drought. In pots, water regularly during summer. You can trim the tuft quite severely at the end of the winter to promote the appearance of new leaves in the following season. Multiplication of the alumroot is done in the spring or at the end of summer. Cut the rhizomes at their base and discard all their leaves except for the last one and then transplant them into a mixture of peat and sand.